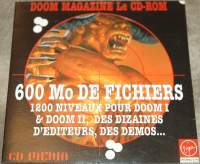 This compilation of Doom levels was an addon-disk for a French magazine. It contained 600MB worth of levels, 1200 for Doom I & II, plus dozens of editing utilities and shareware version of Doom. It also has patches giving new graphics plus docs.